As we get set to start a new season (for those of you who had a winter) of hardscape projects , concrete retaining walls and outdoor living areas, we wanted to touch up on the subject of safety gear that can help you protect yourself while working. We all know that it can be a pain sometimes but in the long run it’s always worth the effort. Hardscape construction safety starts with a basic dress code. Work boots and jeans should always be a must. On hot days jeans can be uninviting but will help protect your legs and prevent debris from getting into your boots. It’s recommended to have a durable boot that goes above the ankles. Steel toes are great and can add extra protection. Depending on the work load at hand, a long sleeve shirt may be the right choice to cover your arms. When using any saws or power equipment, make sure that you have no loose clothing on that could possibly get caught up in a blade or gears, possibly causing serious injuries. A good pair of gloves can really help keep your hands in good shape and can also, believe it or not help with fatigue from a tight grip on tools all day. 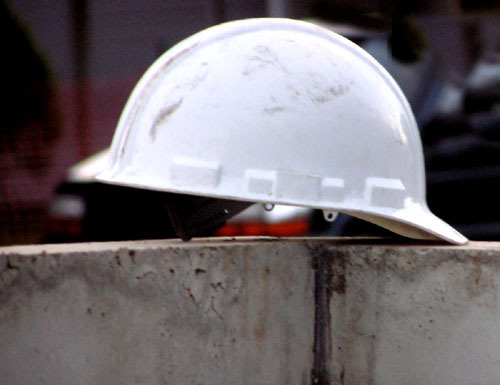 Hard hats and safety glasses should always be on site to be ready for use if the situation arises. Generally wearing sunglasses or safety glasses full time is good practice, no matter what you’re doing there is always a chance of getting debris in the eyes. When working in direct contact with concrete, whether building a decorative retaining wall, walkways and patios, or a backyard waterfall, you should be taking extra precautions to protect yourself. Concrete burns are no joke! If you are in the concrete, rubber boots are a must. It only takes a small amount of concrete in your work boot to get a burn. Proper gloves should always be worn. Concrete on the hands seems to affect everyone differently, from “it doesn’t bother me” to the next person who will feel burning and pain. Even if it doesn’t bother you, a small cut or open blister can become severe if the concrete comes into contact. Last but not least when pouring concrete always wear your safety glasses. “Splashing” can occur at any time when there is wet mud around, especially when using chemicals and other additives. So whether digging footers, tying steel, or pouring mud all day make sure to protect yourself as much as possible. No one plans on getting hurt, so preparing correctly will highly reduce that chance. If you have any experiences or advice on common work place safety, please share with us your thoughts.